जुलाई 2018 में महंगाई भत्ता (DA) कितना % बढेगा? Bht achhi jankari aap ne de hai asap ka bht bht bhanwad. Sir I am serving in air force n have DSP account in adb branch Baraut ac no. 20062535809. There is no interest shown in my passbook on mod balance till date. I want to know how much interest I am getting n why it is not reflected in my passbook. Pl clarify. Rate of interest vary from bank to bank. For MOD account, you must report this issue to your bank. They can better resolve your issue sir. mera DSP account hai..5 transction pr Rs – 172.5 account se charge kr liya..
Maine Personal loan liya hai jisame processing fee liya..
Information bilkul accurate ha, aapko jaankari k abhav k chlte paise liye gye ha. Aap SBI me complaint kijiye. Niche SBI ki official website ka screenshot ha aap check kr skte ha. Lakin hamra ac se 4 time transaction baat paise kata hai our mahine meh kuch na kuch paise kata raheta hai.. I am ex-servicemen. I have one DSP account. 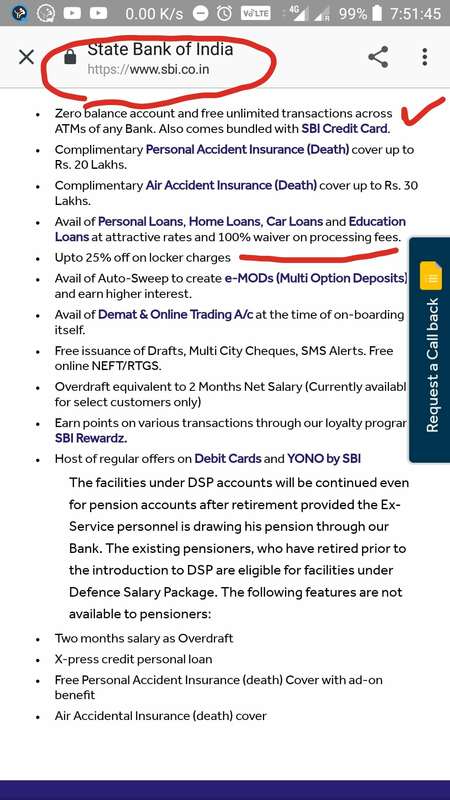 But My pension account is not a DSP account. Can I convert my account in DSP account. Kindly advice me. Or Mene loan liya uska bhi processing fee bhi lga hai. After retirement DSP account se kya koi benifit hai? Sir thanks for great information.